The hunger crisis in the Sahel region of Africa continues to escalate with thousands of refugees from Mali possibly running out of food within weeks. 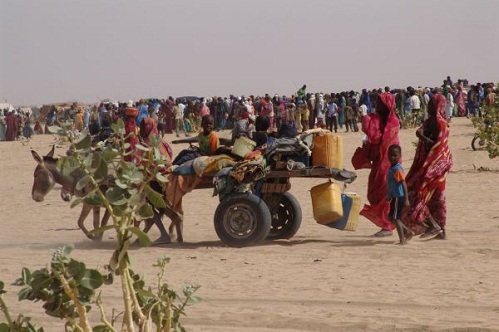 A conflict in Northern Mali, as well as drought conditions, has forced thousands of people to flee to safety in Mauritania and other neighboring countries. But that safety depends on humanitarian aid from the international community. The UN World Food Programme (WFP) is feeding over 56,000 of these refugees in Mauritania. However, WFP warns that by the 15th of May they will run out of supplies. Their refugee relief mission is facing a funding shortage of 11.4 million dollars. WFP relies entirely on voluntary donations from the international community. Around 1,000 refugees arrive daily in Mauritania. With the conflict in Mali far from resolved, things could get much worse. Until a peace process can move forward, more Malians will flee. This will put even more stress on Mauritania and other host countries. WFP says the refugee crisis has put a “great strain on host communities of the Hodh Echargui” an area of Mauritania where 37 percent of the population is regarded as “food insecure.” Mauritania, even without this refugee crisis, is facing severe hunger because of drought conditions. WFP is also lacking funds to aid Hodh Echargui as well as other areas of the country. So what you have in Mauritania is a growing influx of refugees mixed with a hunger crisis from drought. Without adequate funding for WFP and other aid agencies, the situation in Mauritania is certain to deteriorate in the coming months. The Mauritania crisis is part of the larger massive hunger emergency in the Sahel which also includes the countries of Niger, Burkina Faso, Mali, Chad, the Gambia, Senegal and Cameroon. WFP says it is short of 357 million dollars for its relief operation across the whole region. If donations do not come in soon, aid will be limited in what is considered the peak time period of hunger of May through September. The international community can act now and avert famine. But it has to be timely. A donation of funds is just the start of the process. Then comes producing/processing and shipping of food. Navyn Salem, the director of the food producer Edesia, says her company can produce 1000 boxes of supplies a day. Edesia makes a special peanut paste called plumpy’nut which treats infants suffering from severe malnutrition. It’s a food high in demand in the Sahel. But if aid agencies lack donations they cannot order plumpy’nut from Edesia and other producers in a timely fashion. And time is everything when it comes to food aid. The later the donation, the later the order gets processed and the more people suffer. Like WFP, UNICEF is also reporting a shortage of over 60 million dollars for its relief of children in the Sahel. If children do not receive the food quickly, they will suffer lasting physical and mental damage. The international community has a responsibility to act to avoid a potential famine in the Sahel. They need to respond to an area of Africa suffering from conflict and drought. The warnings have been sounded, more so than last year when it came to famine-ravaged East Africa. But are enough people listening? Article first published as Food Running Out for Refugees from Mali Conflict on Blogcritics.